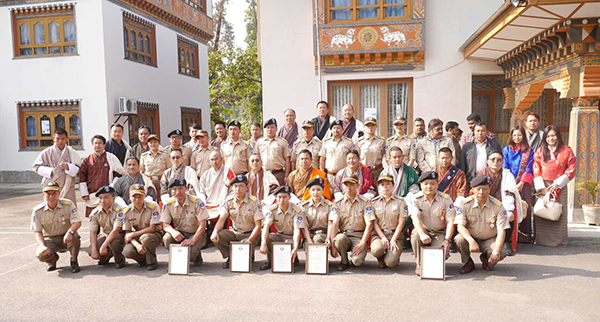 Twenty One Customs Officials, from around the country, were awarded meritorious certificates for excellence in service during the celebration of International Customs Day in Samtse, today. International Customs Day is a globally observed today under the aegis of World Customs Organization. Bhutan is one of its 180 members. Although, Bhutan became the member of the World Customs Organization in 2002; it was only in 2014, the Department of Revenue and Customs started observing the day. This year’s theme, which is Digital Customs, is to promote the use of ICT products in customs process. “We, as the Customs Community, are signalling our aspiration to further develop digital solutions and services making lives easier for the trading community, border agencies and customs officers to help increase operational performance and to facilitate the reinvention of the way do business,” said Department of Revenue and Customs’ Director, Yonten Namgyel. The finance minister, Namgay Dorji, also attended the event.